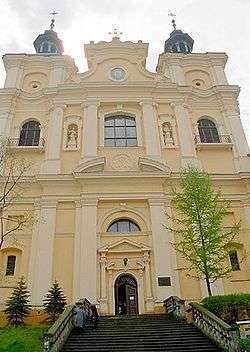 The Ukrainian Catholic Archeparchy of Przemyśl–Warsaw (Latin: Archidioecesis Premisliensis–Varsaviensis ritus byzantini ucraini) is an archeparchy located in the cities of Przemyśl and Warsaw in Poland. In 1087 the Eparchy of Przemyśl was established. The town initially did not adhere to the Union of Brest thus having for a short period two bishops. In 1679, Innokentiy Vynnyckyj became the Orthodox bishop and on 23 June 1691 Innokentiy publicly accepted the Union for himself and for his eparchy, and he remained the only bishop of the town after that the Greek Catholic bishop Ivan Malaxovskyj on the same year moved to Chełm. Innokentiy Vynnyckyj was succeeded in 1700 by his brother by Yurij Vynnyckyj who later became Metropolitan of Kiev and Galicia. In 1946, Bishop Josaphat Kotsylovsky was arrested and extradited to the USSR, where he died in prison. In Poland, where the city of Przemysl and a majority of the eparchy was located (a portion was in the Ukrainian SSR), all priests were arrested and given sentences of between four and ten years. One hundred Ukrainian Greek Catholic priests remained in Poland. After their release, they kept a low profile, serving in the Latin rite Church, many as convent chaplains. Sixteen worked giving pastoral care to Ukrainian Catholics at pastoral centres. In 1977, the Roman Catholic Primate of Poland's Vicar-General for Ukrainian Greek Catholics was also named Dean of the Przemysl Eparchy by the Vatican. Cardinal Slipyj objected to this action as contrary to his prerogatives and appointed the same priest Administrator of the eparchy. In 1981, a second Vicar-General to the Primate was appointed for Ukrainian Greek Catholics in Poland outside of the traditional boundaries of the Przemysl Eparchy. On May 24, 1996, the eparchy was promoted to become the Archeparchy of Przemyśl–Warsaw. ↑ Blazejowsky, Dmytro (1990). Hierarchy of the Kyivan Church (861-1990). Rome. pp. 252, 273, 297. ↑ Herbermann, Charles, ed. (1913). "Diocese of Przemysl, Sambor, and Sanok". Catholic Encyclopedia. New York: Robert Appleton Company. Herbermann, Charles, ed. (1913). "Diocese of Przemysl, Sambor, and Sanok". Catholic Encyclopedia. New York: Robert Appleton Company.